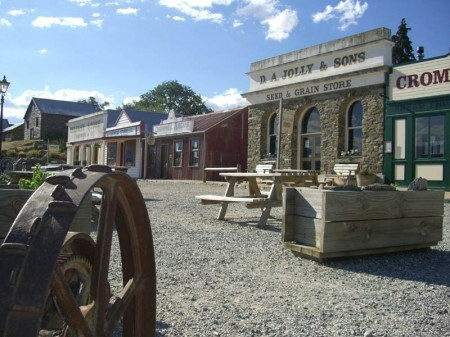 Cromwell in Central Otago is a great place from which to explore the surrounding area. Below are a list of activities that we recommend. 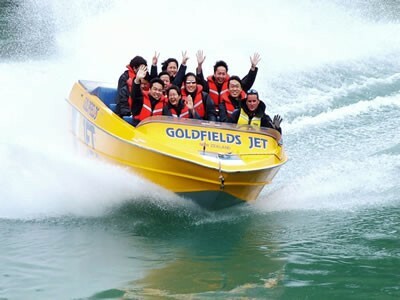 Goldfields Jet has been operating within the Kawarau Gorge since 1991. Since then, the company has safely carried thousands of people on one of New Zealand's most spectacular high volume rivers. This is one spectacular Jet boat ride on the mighty Kawarau River through the heart of one of New Zealand's most historic gold mining regions. Our specifically designed jet boats and highly trained drivers will take you on an unforgettable 40-minute ride through the Kawarau Gorge. 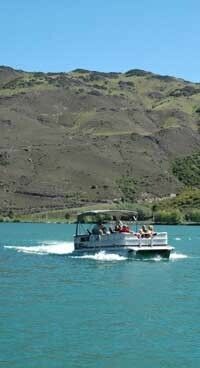 Clutha River Cruises is the only licensed operator providing fully guided and catered tours on lakes Roxburgh & Dunstan in Central Otago, New Zealand. A concept designed expressly for you to UNWRAP YOUR SENSES so that you can fully understand the whole wine region in a 30minute time frame. 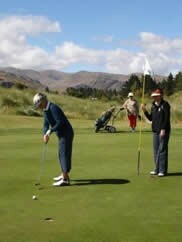 Cromwell’s golf course is further from the sea than any other in New Zealand but is built on genuine 'links' style terrain. The irrigated fairways are gently undulating, while plantings of marram grass penalise stray shots. Trail Journeys has been built up around the very popular Otago Central Rail Trail offering bike hire, complete guided packages, personal railtrail itineraries and transport associated with the railtrail. We can book your accommodation for no extra cost to you, have your bags moved each day and finally bring you back to your starting point once you've finished your adventure! The Otago Central Rail Trail is a year-round recreational facility, designed for mountain bikers, walkers and horse riders (in parts). It is a public reserve and can be walked or ridden in either direction. 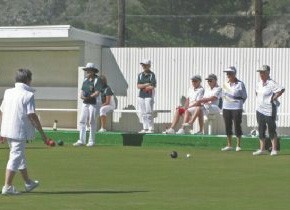 The Cromwell Bowling Club has both indoor and fabulous outdoor grass green facilities and in 2011 celebrated 100 years of operation. The Club has an enjoyable social afternoon on Fridays, open to all and run on a tournament basis. This is followed by a relaxing social time in the Club House. For the novices amongst you there is coaching available on Thursday evenings, so there is no excuse not to give it a go! 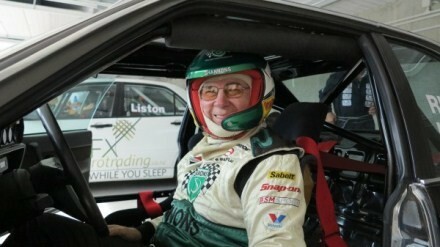 If that's all a little too fast-paced for you then there is also the fascinating National Motorsport Museum, a cafe and gift shop. 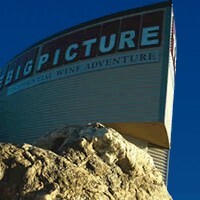 All this whilst being surrounded by stunning snow-capped mountains - a great day out! The Mall in central Cromwell has a wealth of shopping, eating and information for the visitor. The Mall houses among other things the iSight Information Centre and Museum - call in here first for information on this wonderful part of Central Otago. Following the construction of the Clyde Dam, Cromwell gained the beautiful lake Dunstan, but lost it's old town centre in the process. This history however has not been forgotten! Many of the original buildings from Cromwell's past have been restored or reconstructed and now house local crafts and cafes. There are wonderful shops and artists galleries as well as insights into the original businesses that occupied these meticulously restored buildings. Old Cromwell is also home to the Central Otago Farmers Market held every Sunday from November to Easter.